Talented, young Cumbrians can compete for a musical scholarship thanks to funding from the Johnson Fund. 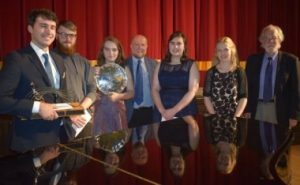 The committee for the The Keldwyth Cumbrian Young Musicians Award received £1,000 to re-establish the annual competition. The Award, which began in 1983, benefits its applicants by giving them the experience to develop their performance skills. The winner and runners-up also benefit financially as there is a real need for funding for young musicians who are still at school and need private tuition, and also those at college. Applicants are asked to state how they will use the award, to which the response is mainly for the cost of expert musical tuition, instruments, courses, and travel. Dr John Hiley, Secretary of the committee said: “The Keldwyth Award is a prestigious award which has a unique status in Cumbria’s musical life. It helps raise the aspirations of our young people, and supports them in fulfilling their potential. “Funding this project will help secure the future of the Award. It will provide the financial support required whilst the new management team make the necessary measures to renew the subscriber base and better address the use of modern communication methods such as the website and Facebook. The Award, managed by its founding committee, has been, until now, self-financing through subscribers, ticket sales and donations. In recent years subscriber income has fallen, and owing to retirement there is no longer support from the hall that hosted the finals concert. Thanks to the grant and the hard work of committee members, they now also have a good working website. This has led to an increase in attendance at performances, more subscribers who make annual contributions, and has attracted other donations so that they have been able to increase the prize for the runners-up.